We’re hoping two years from now these guys will be competent “handy steers” who will help us put up hay. In five years they’ll get the proud title of “oxen” and be capable of heavier work. But for today their job is being babies, drinking milk and enjoying grooming, and getting used to life. Deer is a week old, Case was born just over a day ago, his navel was still wet when I picked him up yesterday. They are close relatives, and hopefully will grow up in sync to be a well balanced team. 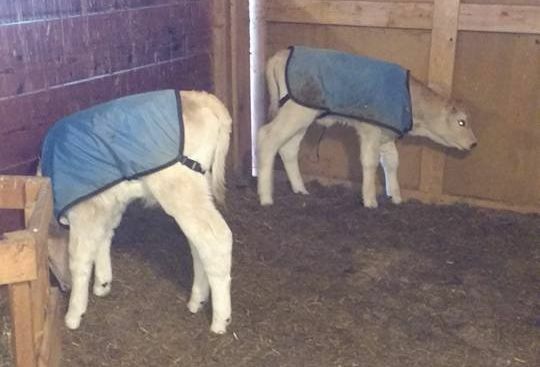 Thanks to breeder Jason DeMay of Towpath farm for getting us off to a great start, and all my other farmer friends that have been advising me on my first calves.